I was always rather grossed out when I'd see someone on Nickelodeon get Slimed with a bucket of green goop! But while our friends were here, they bought their daughter a pail of Slime to play with and it really was pretty cool stuff...literally and figuratively! 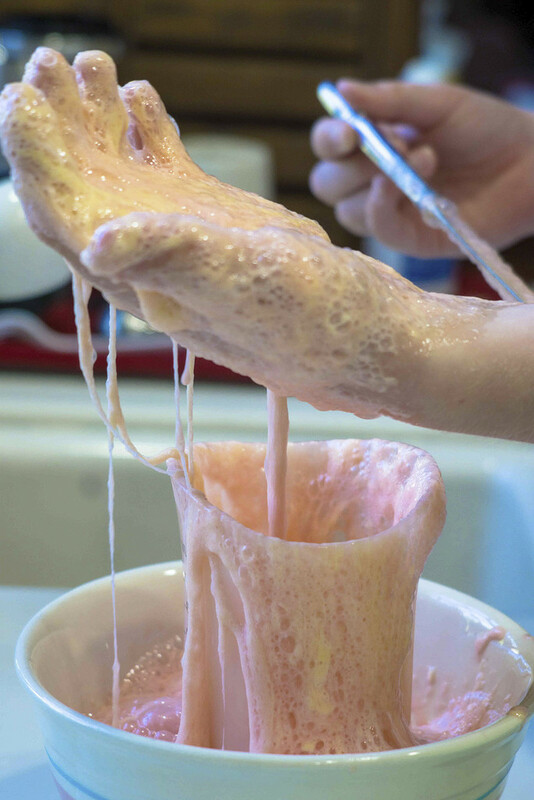 When the grandkids came to visit, I looked for a recipe to make it, and decided on the Volcanic Slime...the more gross the better for little boys! Reading about it, it's really a science experiment that causes a chemical change in the ingredients. Add vinegar and baking soda to it all and it fizzes and bubbles over, but in the end, it's all slime...to stretch and twist and play with for days! And without refrigeration, it stays very cool...I'm thinking "summer" and draping it around my neck! Don't scoff until you try it! I think I will leave it to your grandkids to play with! Lol! I was always horrified when I saw anyone slimed over their head and face! I expect it’s fun but I think I will watch rather than try! Well, now, who wouldn't want to play with that? Hopefully not Tigger! What a great thing to do with the grandkids! wonderful capture of the slime standing up like that! Ha ha ... so funny. At first glance, before seeing the whole image on my feed, I thought it was your foot and you were shaving your legs in the bath! Then I realised it was a hand ... then I scrolled down for the full picture. Lovely fun gloopy capture! Knock yourself out...you're gonna love it! Looks like fun. We had many visits to Nickelodeon Studios when our boys were young.